Research teams from 39 institutions around the world collected and analyzed 91 samples of adrenocortical carcinoma (ACC)—hoping to improve our understanding about one of the rarest, and lethal, types of cancer. This comprehensive analysis was performed as part of The Cancer Genome Atlas (TCGA) Research Network. The investigators from this new study were able to identify several genes that drive adrenal cancer. Moreover, the analysis uncovered double the number of genetic drivers already known to fuel adrenal cancer. This study was part of TCGA, a program overseen by the National Institutes of Health (NIH) that aims to generate comprehensive, multi-dimensional maps of the key molecular changes in major types of cancer. “This data has implications for diagnosing and predicting outcomes for adrenal cancer. It also allows us to probe deep into the biology of the disease to understand how these new gene mutations contribute to adrenal cancer progression and formation,” noted co-senior study author Gary Hammer, M.D., Ph.D., professor at the University of Michigan Comprehensive Cancer Center. The collaborations were critical to the success of this project. Since adrenal cancer affects only two out of a million people worldwide, one institution was insufficient to provide enough patients to generate meaningful research. “We've been working on an adrenal cancer network around the world since 2003,” Dr. Hammer remarked. “It speaks to the power of collaboration with rare cancers. It's very difficult to do advanced genomics without collaboration, especially in a disease in which the number of patients is so small,” added co-senior study author Thomas Giordano, M.D., Ph.D., professor of pathology at University of Michigan School of Medicine. The ACC study examined 91 tumor samples from six countries across four continents—providing a global picture of the disease. One of the major findings that the researchers uncovered was the identification of a third class, or subtype, of ACC. The study showed that the three subtypes of ACC hold significantly different outcomes for patients, and—based on their distinct molecular biomarkers—could help determine the best course of treatment for each patient. “Clinical implementation of this three-class grading system would represent a true advance for patient care,” the authors wrote. 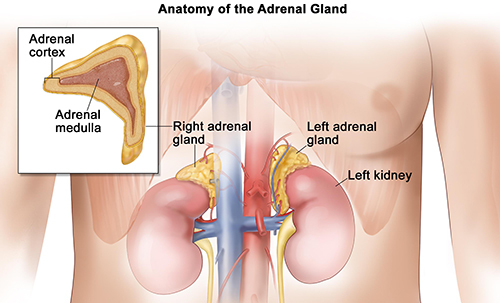 Another key finding was that many adrenal tumors undergo whole genome doubling—a phenomenon in which each chromosome in the gene replicates and creates a second copy. This is indicative of genomic instability, which is particularly prominent in adrenal cancer. “We suspect that understanding the biology of how that happens and the consequences of that event will ultimately help us define and discover new therapies,” Dr. Hammer stated. Additionally, the study identified another subset of genes that may drive the formation and progression of ACC tumors. Also, based on a review of clinical trials and FDA-approved cancer drugs, the study identified 51 genetic alterations that could provide targets for new therapeutics. “We hope these results illustrate how integrating molecular and clinicopathological data can inform more precise therapeutic decision making for ACC patients,” said Dr. Whitsett, who along with TGen colleagues provided analyses of ACC's cellular pathways, clinical pathology data, and overall disease expertise. “Our results represent the most complete characterization of adrenal cancer tissues, and many indicate a key to successful targeted therapy for this disease,” said co-senior study author Roeland Verhaak, Ph.D., associate professor of bioinformatics and computational biology at MD Anderson Cancer Center.